I arrived in Bangladesh in November 2017 at the peak of a measles outbreak. Within two weeks I found myself in the midst of one of the largest diphtheria outbreaks in recent history. Although there is a diphtheria vaccine, the Rohingya people's lack of access to healthcare in Myanmar meant they weren’t adequately protected against the disease. Diphtheria is highly contagious, and the crowded living conditions in refugee camps in Bangladesh made Rohingyas even more vulnerable. I had never seen diphtheria in my life. It was no different for my colleagues. Literature was limited. The world had almost forgotten about diphtheria. We were educating ourselves as we went along – seeing patients through the day, reading and discussing late into the night – World Health Organisation case definitions, guidelines and very limited research documents. Within a few weeks, the medical team had become very effective in diagnosing suspected diphtheria. We went on to train and educate the nurses and outreach workers as well as medical teams from other non-governmental organisations (NGOs). In its early stages, diphtheria resembles flu or tonsillitis – making early diagnosis extremely difficult. Isolation of patients is critical, but due to the similarity of symptoms, we found diphtheria patients in the wards with other patients a few times. As a result, anybody who had been within a three-metre radius of these patients had to be prescribed the seven-day antibiotic preventative treatment. Severe diphtheria is treated using the diphtheria antitoxin (DAT). As the anti-toxin was in short global supply in the initial days, our diphtheria treatment facility had very strict criteria for administering it – it was given only to severely ill patients with a high chance of survival, children and pregnant women. The outbreak created challenges from all sides. We were already stretched with the measles outbreak, but diphtheria pushed us to the brink. At the peak of the outbreak, we were seeing close to 150 suspected diphtheria patients every day in the facility I worked in alone. All our wards were full. Contact tracing is as important as treatment in tackling diphtheria; our team of outreach workers identifies the people the patient had been in contact with in order to protect them with the diphtheria vaccination or preventative treatment. You can imagine how challenging it is to carry out contact tracing in a crowded refugee camp. By 22 January, MSF had treated more than 4,371 cases of diphtheria. From the second week of January onwards, the cases dropped significantly because of the rigorous contact tracing and mass vaccination campaigns. 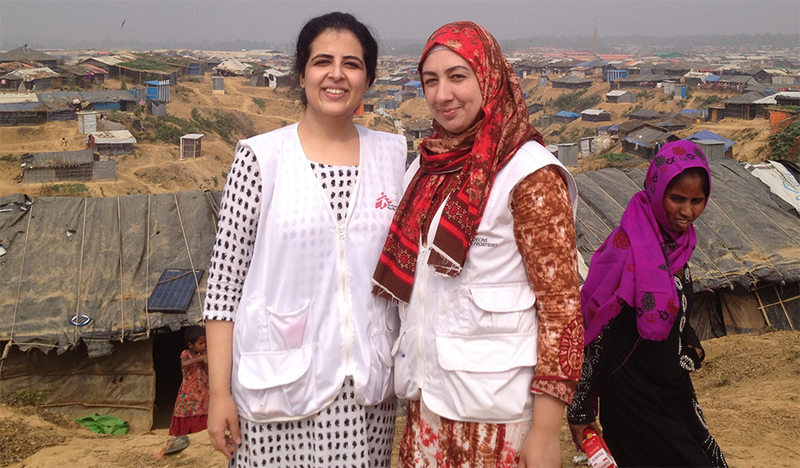 The availability of the diptheria antitoxin also increased and MSF assisted the Bangladesh Ministry of Health in their vaccination campaigns by training their nurses and outreach staff. It is safe to say that the worst of the diphtheria outbreak is behind us. But, with the onset of the monsoons, the danger of water-borne diseases is imminent. The medical and water and sanitation teams have been preparing ahead of time and hopefully will be ready for whatever is thrown at them.